We celebrate the birthday of our Country this weekend. Please remember all those who sacrificed so much to give us our many freedoms. We will be open Saturday, July 3 until 5 PM and will reopen Tuesday, July 6 at 10 AM. 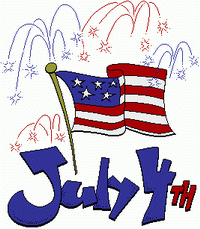 Have a safe and happy Fourth of July! Cloth Diapers Are Catching On Again! -the average child uses 6,000 diapers in two years. Wow! Think of the difference to the environment and the cost savings if even a small percentage of children were switched to cloth diapers! We know that disposable diapers are a little more work, but also think of the the cost savings. We have noticed a real uptick in the number of cloth diapers that we sell. We carry the traditional Gerber diapers (both prefold and flat fold) as well as organic diapers by Under the Nile and the all-in-one diapers by Kushie. There are lots of alternative these days. Please consider the the eco-friendliness and thriftiness of using cloth diapers at least part of the time. The Juvenile Product Safety Commission (JPMA) today announced the following: “In a coordinated effort to allay fears about drop side cribs, seven manufacturers issued a voluntary crib announcement in conjunction with the Consumer Product Safety Commission (CPSC.) As part of this effort, the CPSC has acknowledged that issues with drop sides can occur due to misassembly or age-related wear and tear and are advising consumers to get new cribs if their cribs are older than 10 years of age.” Most manufacturers are offering a device to immobilize the drop sides of cribs. Please note that this is a voluntary action on behalf of a group of crib manufactures to provide immobilization hardware or other solutions to consumers who are concerned about drop sides on cribs. The JPMA release further says, “Parents can be confident that properly assembled fully functional cribs that are not part of a recall, and are in good condition are safe for use and provide the safest sleep environment for children. This recall highlights the importance of periodically checking the hardware on your crib for any loose or broken parts and to make sure all fasteners and screws are tight…Manufacturers offer replacement instructions and manufacturer authorized parts for their cribs. Makeshift hardware should never be used.” For additional information visit www.cribsafety.org. US News and World Report recently had an article about buying used goods. The first three things on the list were carseats, cribs and bicycle helmets. Carseats and bicycle helmets, once they have been involved in an accident should be disposed of. One crack can compromise the safety of an item. You don’t know the history of an item when buying it used. Cribs are another matter, with all the publicity about recalls and safety concerns, you can’t be sure that the crib you are buying used hasn’t been on a recall list somewhere, missing an important screw, or perhaps one of the dropside styles that are now verboten. Used breastpumps and breastfeeding equipment are another item not on this list but that we feel strongly about. Pathogens in bodily fluids can be easily transmitted and human breatmilk fits in this bodily fluid category. Medela talks all about this on their website. Per your request, we decided to leave our tent sale up through Saturday. There are still a lot of great bargains! One of God’s greatest gifts is a happy, involved Father. Here’s to all you Dads out there-Happy Father’s Day. Our semi-annual sale starts Tuesday, June 15 at 10 AM. This is our big one! -Boys Sweaters-values to $65, NOW $20. …plus other deals on carseats, socks, tights too numerous to mention! See you at 10AM on Tuesday! A recent article in Earnshaw’s debated the harm of phthalates. Apparently, 60 Minutes aired a segment questioning what, if any, safety hazards phthalates pose. Apparently there are many conflicting lab tests-rats are harmed, but not monkeys. Who knows? The concern over phthalates prompted the Consumer Product Safety Improvement Act, which, in our opinion, straight jackets the small, entrepreneurial mom and pop manufacturers. The legislation is so cumbersome that few, if any, small businesses can meet the requirements. Still, common sense tells us that natural products are better for all of us and better for the environment. It is just too bad that we need another set of laws and another bureaucracy to tell us that. Speaking of safety, we received another recall notice this time for strings on garments posing strangulation hazards. (Fortunately the recall did not pertain to anything we carried.) Please check your child’s clothing for anything dangling or loose. This is one of those “no brainers” that could save a life. You are currently browsing the Junior Towne Blog weblog archives for June, 2010.